Last month (May'11), ABAP and QBAP participated in the Pakistan Scrabble Association monthly competition, renamed as the Chisty Memorial Scrabble Competition, after the man who made the game popular and promoted it as a serious sport in the sub continent. He died a week before the competition and so the tournament has been thus named. An interesting item there was that computers were set up around the room so that players who challenged a word could look it up on a dictionary software. This month QBAP decided to participate in the All Pakistan Championship (category A; ages 11 to 17). Alhumdulillah he enjoyed the event, though the food was horrible and he had a stomach ache that night. 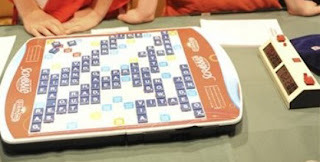 Every participant plays 6 games, the computers picks the initial opponents, after each game the players hand over the score sheet, the scores are entered into the computer which then selects the opponents of the next game. QBAP won 2 games, one against a 14 year old and the other against a 15 year old and in one game his opponent didn't show up, so he was marked down as winning 3 games. Masha'Allah. He looks forward to particpating again, and both ABAP and QBAP are considering participating in their monthly events once in a while.